The bumper sticker is a 5″ x 3″ oval, made out of vinyl and features a peal and stick backing that is safe for cars. This product is part of the Gus The Golf Ball™ product line, which also includes over 100 products like t-shirts, hats, mugs, mouse pads and more. Gus also comes in a cartoon clip art set with more than 60 funny illustrations of the cartoon golf ball character doing golf related activities. Fun for any golfer, and a great tool for promoting golf tournaments or any business related to golf. This entry was posted in Golf Jokes and tagged bumper sticker for golfers, golf bumper sticker, gus golf ball, gus golfer, lifes short, lifes short bumper sticker, swing hard, swing hard bumper sticker on January 17, 2013 by datcoart. This is a great gift for any golfer. Life’s short – swing hard! The cartoon golf ball is soaring through the air, with attitude. Gus The Golf Ball™ is featured on a variety of t-shirts and other products. Each make great gifts and hole prizes for golf tournaments. 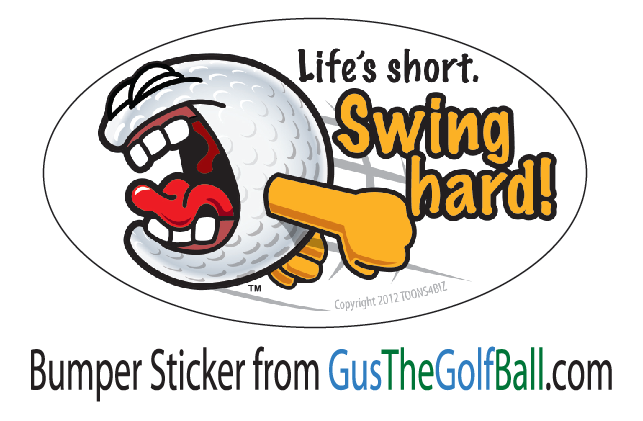 Check out the entire line of Gus The Golf Ball™ products at zazzle.com/fungolfprizes. Gus also comes in a robust clip art set featuring the cartoon golf ball character in more than 60 funny illustrations. 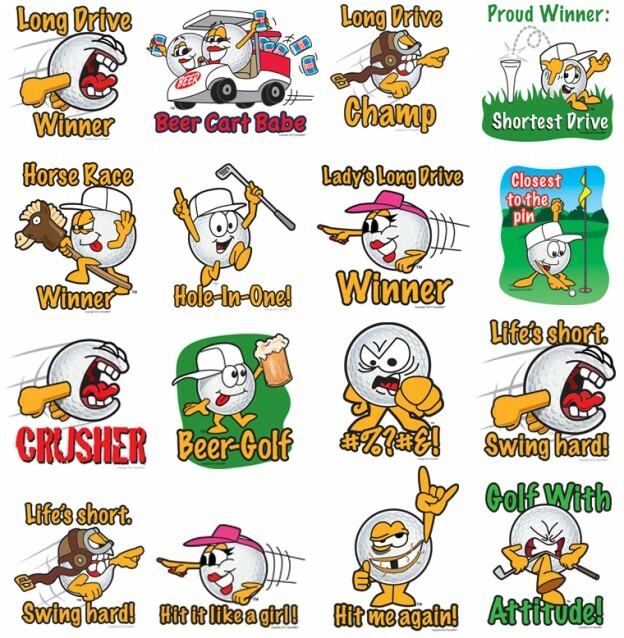 See the entire Gus The Golf Ball™ clip art set at Toons4biz.com. 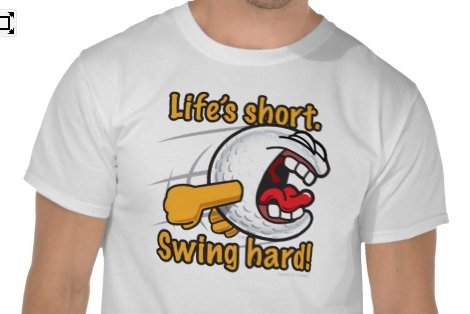 This entry was posted in Golf Jokes and tagged gus golf, gus golf ball, gus golf ball shirt, life's short shirt, life's short swing hard, lifes short, swing hard, swing hard shirt on January 15, 2013 by datcoart. Build Golf Clubs: Make $ 50 – $ 100 an hour! – Why buy golf clubs, when you can build your own for a fraction of the cost? We teach you how. The Golf Tee Store offers the best prices on the internet for Personalized Golf balls, Logo Golf Balls and Personalized Golf Tees that can be combined into a personalized package. A: A man will spend 5 minutes looking for the lost golf ball. They’re two things you can enjoy even if you’re bad at both of them. A bad golfer goes: WHACK…”Damn”! A bad Skydiver goes: “Damn”!…WHACK. What should you do if your round of golf is interrupted by a lightning storm? Walk around holding your 1-iron above your head, because even God can’t hit a 1-iron! The only difference between driving in golf and driving a car is that when you drive a car you don’t want to hit anything. What are the four worst words you could hear during a game of golf? He doesn’t have to produce anything to prove his story. The other day I was playing golf and I hit two of my best balls. “One who plays with his boss,” came the reply. This entry was posted in Golf Jokes and tagged cartoon golfer, funny golf jokes, golf cartoons, golf fun, golf gags, golf humor, golf jokes, golf laughs, golfer jokes, silly golf on January 10, 2013 by datcoart. Introducing Gus The Golf Ball™. Gus is a cartoon golf ball that comes in a robust clip art set featuring him in more than 60 funny illustrations. Gus is also featured on more than 100 premium items that are perfect as hole prizes or gifts. Check out the array of funny golf t-shirts, hats, mugs, bumper stickers and more. Promote your next golf tournament using templates featuring Gus for: Mulligan tickets, drink/food tickets, table toppers, rule sheets and hole contest signs. Each of these items can be easily customized with sponsor logos. You can also order a life-sized cut out of Gus to welcome tournament participants. This durable plastic cutout is 5 foot tall and features a dry erase section where you can put a welcoming message, instructions or directions. Use it over and over again. Get hole contest signs featuring the same Gus cartoon as the t-shirt you give the winner. Customize these hole signs with sponsor logos. Buy sign/shirt packages and save! Make your next golf tournament more fun and memorable. Let Gus help you! This entry was posted in Golf Jokes and tagged cartoon golf ball, cartoon golfer, funny golf clip art, funny golf clipart, golf cartoon, golf clip art, gus golf, gus the golf ball, life's short swing hard, lifes short, swing hard on January 10, 2013 by datcoart.